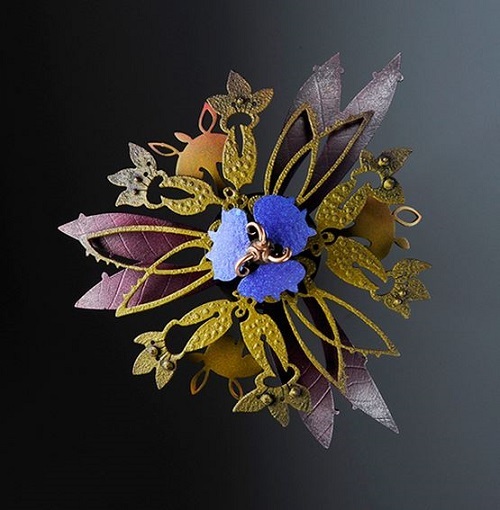 The very best jewelry designers are those who can combine artistic talent and creativity with the precision and skill of a master craftsman or craftswoman. 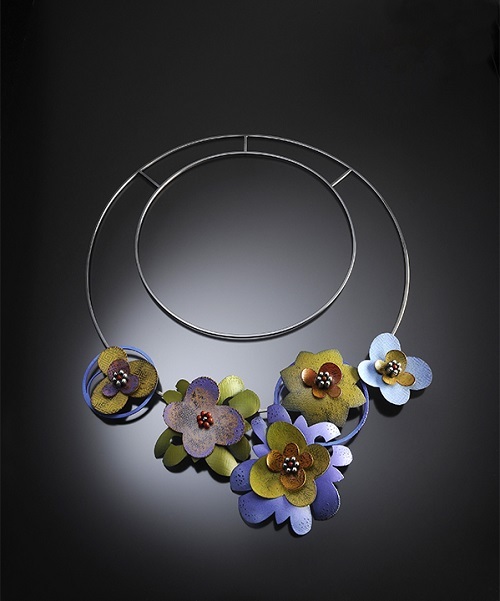 Master metal smith, Linda Threadgill is one of those inspirational creators. 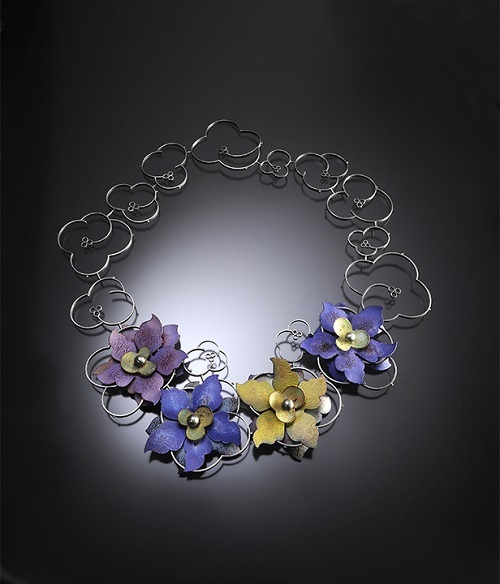 Her breathtaking work includes not just jewelry but metal sculptures and vessels. 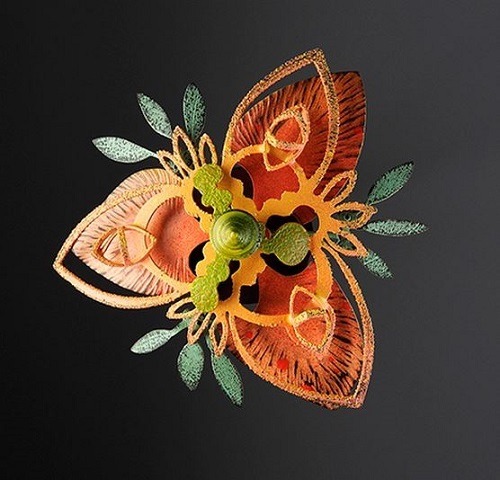 It was her rosette collection of stunning brooches and necklaces made with copper and/or brass which caught my eye. 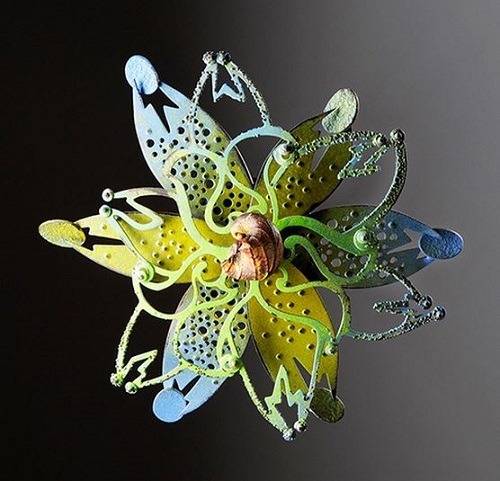 The pieces are architecturally inspired with some distinctive botanical shapes, all layered into what are mini-sculptures. She added texture by running the metal through a rolling mill. She also introduces tiny dapped domes and punches out small holes from the metal. But she also does more than that. Linda explained, "The textures were etched using photo resists or sometimes other directly applied resists. After the etching the pieces were colored with paint and sealed with clear acrylic." The results are simply gorgeous! 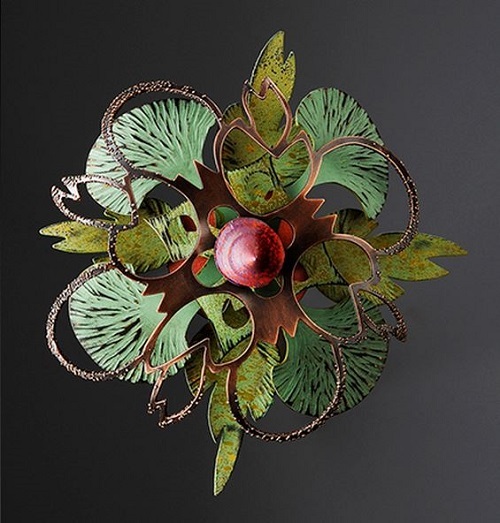 The rosette series is the latest project in a lifetime of metal work. 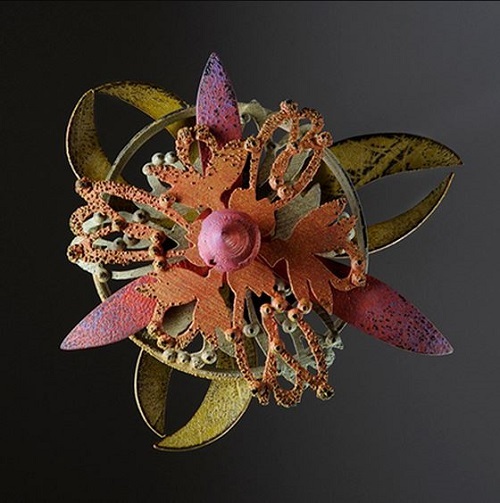 She retired after 25 years as Professor Emerita at the Art department of the University of Whitewater-Wisconsin where she taught metal work. Linda is continuing her artistic journey as a studio artist now based in Santa Fe, New Mexico. Absolutely amazing; thanks, Pearl. I love metalwork and this collection makes me feel very inadequate. The last piece puzzles me though - how do you get it on? I am guessing it is a large collar so it will slip over the head. But WOWZA!! What stunning work she does!!!!!!!!!!! I sat and drooled over every single gorgeous photo!! 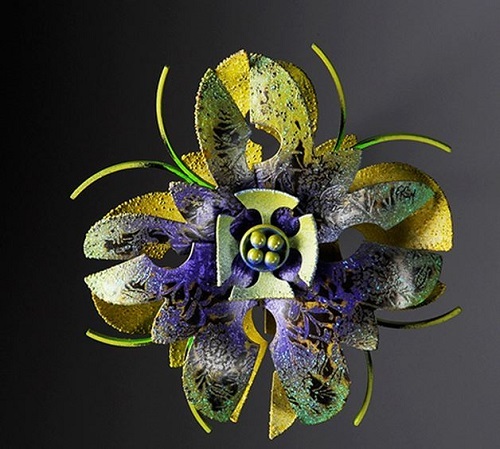 And I kept saying - I wish I could do something like this with my own metalwork. Linda certainly deserves to have held that position for so long and she makes me want to go to my studio and practice practice practice! Very unique designs! Flowers like I've never encountered before. Amazing talent !!! 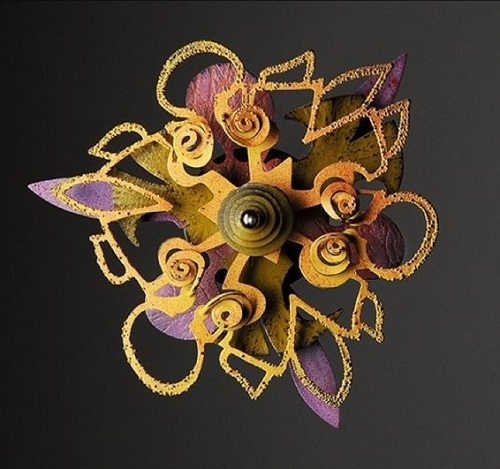 Each piece has such depth and is so intricate, certainly something I would expect to see in an art museum. I would love to see the Rosetta necklaces on a live model as they are confusing pieces to imagine how they are worn and how they would look like on a human form.